Digital Trends' Dena Cassella picks the ten best laptops of 2009, and topping the list is the 15" MacBook Pro. Cassella offers the boilerplate caveat that "Macs aren't for everyone," but says that for those of us who adore Apple's products the new MacBook Pros are sturdy and stylish machines, although being Macs, they're of course "rather pricey." PR: Air travelers will again encounter strict enforcement of regulations on flying with lithium batteries this holiday season, according to the International Imaging Industry Association (I3A), the leading global association for the imaging industry. Loose lithium batteries - both the primary lithium digital camera batteries and the lithium-ion types that power laptop computers, plus some AA batteries - have been prohibited in US checked baggage since January 1, 2008 due to their extreme flammability; elsewhere in the world, regulations may be even more stringent. I3A recommends transporting any spare lithium batteries in carryon baggage only, for safety's sake and to avoid possible confiscation of items from checked baggage. Additional pointers and information can be found on the US Transportation Security Administration's (TSA) website. "In my travels to international standards meetings in various parts of the world this year, I have been reminded by TSA inspectors and airline personnel to remove all lithium batteries from my checked baggage," says I3A Standards Director James Peyton. "These warnings occurred at airports in North America, Asia, and Europe." I3A also offers travelers advice on making sure that the precious holiday memories they capture on film, including single-use film cameras, or digital media arrive at home safely after passing through security scanners. In general, digital media need no special handling, while film should be treated carefully. These recommendations are the result of research conducted by I3A's Integrity in Transportation of Imaging Products (ITIP) committee jointly with the TSA on the X-ray machines and scanners used to inspect checked baggage and carryon items. Test specifications and results details are available online. After receiving recent reports of damage to printed circuit board film, ITIP is now organizing tests of new equipment used in US customs inspection, in order to identify potential sources of damage to commercial imaging products and plan a damage prevention program for products entering the United States. Information about I3A can be found online or by phone at +1 914-285-4933. "These days, your laptop is your work station, your play station, and occasionally your best friend. However, it doesn't cost $700 to fix your best friend's face if you drop a book on it. "If you've damaged your MacBook's screen, the repair isn't covered by warranty, and having it replaced by an Apple technician costs about two-thirds of the price of a new laptop. Here's how to execute a quick repair on the cheap...."
"In tests, the Standford researchers were able to charge and discharge the paper battery up to 40,000 times, a 10-fold increase over conventional lithium-ion batteries." 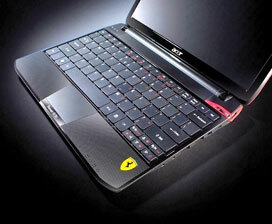 PR: Acer America, part of the world's second largest PC vendor, debuts the new Ferrari One notebook PC to US customers. An Acer exclusive, the Ferrari One is a full-featured, 11.6" notebook PC utilizing the same exquisite details and performance features celebrated by Scudetto Ferrari, the world's most prestigious racing team. In the true spirit of the Ferrari racing team, the Ferrari One notebook combines performance and extreme portability. Fueled by VISION technology from AMD, the notebook delivers highly responsive, balanced multitasking performance via the AMD Athlon™ 64 X2 dual-core processor with low-power CPU designed for long-lasting battery power. ATI Radeon™ HD 3200 Graphics provides high-definition visual quality coupled with up to 4 GB of DDR2 667 MHz system memory to drive digital and multimedia features and other demanding applications with ease. 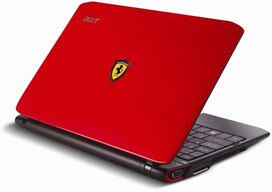 The Ferrari One comes equipped with Windows 7 Home Premium and 250 GB hard drive. Along with its 11.6" HD widescreen display, the Ferrari One notebook features a sleek, ultraportable design, measuring about one inch thin and weighing only 3.31 pounds. The look and feel of Formula 1 racing is shown throughout the notebook's detailed design, including the checkered palm rest extending into a comfortable full-size keyboard, the metallic LED-lit power button and yellow prancing horse emblem that perfectly complements the notebook's red cover. Ferrari enthusiasts will also note the tire-shape grips underneath the notebook's body, racing-inspired wallpaper and calendar, as well as a quick access key to Ferrari.com. The notebook features enhanced stereo speakers and Dolby Home Theater Audio Enhancement, which deliver vibrant surround sound and bass effects to bring a true cinema-style experience to movies, music and casual games. The Ferrari One notebook's integrated 802.11a/b/g/Draft-N wireless technology and Gigabit LAN facilitates smooth and trouble-free emailing and web browsing. The Acer Crystal Eye webcam and Video Conference solution enables high-quality video chats and VoIP with friends, family and work associates, even in noisy environments. The notebook's Ferrari-engraved Multi-Gesture Touchpad lets users pinch, flick and swirl fingers on the touchpad for intuitive navigation. It also allows users to scroll, zoom in and out and flip through web pages, photos, spreadsheets and more. "Both Acer and Ferrari have a tradition of designing products built on passion, innovation and performance," said Chris White, senior director of US business management for Acer America. "The new Ferrari One notebook blends the ideas of racing and technology into a superior PC product." The Acer Ferrari One FO200-1799 notebook is available now via Acer's authorized resellers and at major retailers nationwide, with prices beginning at $599.99. The Ferrari One comes with a one-year limited warranty. 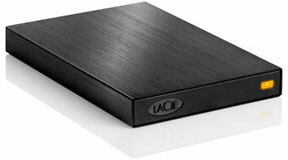 PR: LaCie has introduced what it claims to be the most compact 2.5" hard drive on the market - LaCie Rikiki, in metal. Measuring just a mere 110cm3, its sophisticated form factor holds up to 640 GB of media that you won't mind storing in a pocket or purse. Encased in brushed, sturdy aluminum, the LaCie Rikiki (which means tiny in French) represents a resilient aesthetic that protects your media from everyday blunders and unwelcome fingerprints. Its lightweight design makes it a perfect companion for keeping your digital world close at hand. "We are part of a generation that wants more from our electronics, but in the smallest form factor possible, and with a competitive price," says Anne-Sophie Marchand, Consumer Product Manager. "With the LaCie Rikiki, we have done just that by fitting high-performance and high-capacity in the palm of your hand, for under $100." 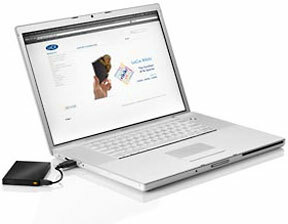 Leveraging the versatile USB 2.0 interface, the LaCie Rikiki is instantly compatible with your Mac or PC. Just plug it in and you're ready to store and share your favorite media with high-speed performance. LaCie Rikiki also offers USB Boost software for enhancing speeds up to 33% (Windows only). LaCie Rikiki also comes with a simplified software suite - for quick setup and easy-to-use backup management - enabling complete configuration in just a few clicks. The LaCie Rikiki is an all-in-one solution for storage mobility. The LaCie Rikiki will be available in 250 GB, 500 GB, and 640 GB capacities through the LaCie Online Store, LaCie Reseller+, and LaCie Corner, starting at the suggested retail price of $74.99 (excluding VAT). Size: 109.7 x 75 x 13.4 mm / 4.3 x 2.9 x .5 in. Weight: 158 g / 5.57 oz. PR: Seagate Momentus Thin Laptop Hard Drives deliver slim size with a big byte: The world's first 7mm, 2.5" form factor drive created for slim computing designs. Seagate integrators and OEM customers are faced with an increasing demand for thinner yet fully functional mainstream laptop computing solutions. Until recently, the only option for these thinner solutions revolved around high-priced, slow performing 1.8" drives and high-priced, fast solid state drives. Because both storage types were costly options, system designers had no choice but to build thinner chassis only for their high-end lines. Enter Seagate ingenuity. Realizing that the dilemma our customers faced was the lack of affordable thin storage for entry-level to mainstream laptops, high-end netbooks and thin ultraportables, Seagate designed a drive that could leverage current laptop drives in both material and product design. This successful initiative resulted in the design of the Seagate Momentus®Thin drive, the world's first 7mm, 2.5" form factor drive. The new 7mm drive is a reduced-height platform that still spins at the industry norm of 5400 RPM with 8 MB of cache, and with two capacity points - 250 GB and 160 GB. These sizes align with the sweet-spot capacity points our customers are looking for in a fully functional laptop system today. And although the special design requires code and some component changes, it leverages Seagate expertise to deliver a much more affordable solution for thinner laptop computing needs. PR: Toshiba Corporation has announced the launch of a 64 GB embedded NAND flash memory module, the highest capacity yet achieved in the industry. The chip is the flagship device in a new lineup of six embedded NAND flash memory modules that offer full compliance with the latest e•MMC™ standard, and that are designed for application in a wide range of digital consumer products, including smartphones, mobile phones, netbooks and digital video cameras. Samples of the 64 GB module are available now, and mass production will start in the first quarter of 2010. The new 64 GB embedded device combines sixteen 32 Gbit (equal to 4 GB) NAND chips fabricated with Toshiba's cutting-edge 32nm process technology, and also integrates a dedicated controller. Toshiba is the first company to succeed in combining sixteen 32 Gbit NAND chips, and applied advanced chip thinning and layering technologies to realize individual chips that are only 30 micrometers thick. Full compliance with the JEDEC/MMCA Version 4.4(V4.4) standard for embedded MultiMediaCards supports standard interfacing and simplified embedding in products, reducing development burdens on product manufacturers. Toshiba offers a comprehensive lineup of single-package embedded NAND Flash memories in densities ranging from 2 GB to 64 GB. All integrate a controller to manage basic control functions for NAND applications, and are compatible with the latest e•MMC standard and its new features, including defining multiple storage areas and enhanced security features. Demand continues to grow for embedded memories with a controller function that minimizes development requirements and eases integration into system designs. Toshiba has established itself as an innovator in this key area. The company was first to announce a 32 GB e•MMC compliant device, and is now reinforcing its leadership by being first to market with a 64 GB generation module. The JEDEC/MMCA V4.4 compliant interface handles essential functions, including writing block management, error correction and driver software. It simplifies system development, allowing manufacturers to minimize development costs and speed up time to market for new and upgraded products. A wide product lineup supports capacities from 2 to 64 GB. The high-capacity 64 GB embedded devices can record up to 1,070 hours of music at a 128 Kbps bit rate, 8.3 hours of full spec high definition video and 19.2 hours of standard definition video(3). The 64 GB device stacks sixteen 32 Gbit chips fabricated with leading-edge 32nm process technology. Application of advanced chip thinning, layering and wire bonding technologies allowed Toshiba to achieve individual chips only 30 micrometers thick, and to layer and bond them in a small package. 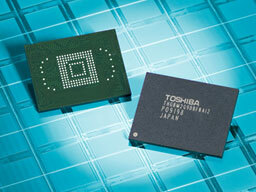 The result is the highest density embedded NAND flash memory module in the industry. The new 64 GB product is sealed in a small FBGA package which is D14 x W18 x H1.4mm and has a signal layout compliant with the JEDEC/MMCA V4.4. The internal structure of the 64 GB module. * Available only for THGBM2G5D1FBAI9 and THGBM2G4D1FBAI8. e•MMC is a trademark and a product category for a class of embedded memory products built to the joint JEDEC/MultiMediaCard Association (MMCA) MMC Standard specification. HD and SD are calculated at average bit rates of 17 Mbps and 7 Mbps, respectively. Newer Technology, Inc. (NewerTech http://www.newertech.com ) announced today four new NuPower(r) High Capacity Replacement Batteries for Apple 13.3" MacBook, MacBook Pro 15", and MacBook Pro 17" non-Unibody notebook computers with up to 10% greater capacity over the factory original batteries for the longest runtimes available on the market. NewerTech NuPower High Capacity Li-Ion Replacement Batteries use top tier cells and are designed, engineered, and manufactured to deliver the highest run times available. As a result, MacBook and MacBook Pro users can now listen to more music, watch more videos, and/or get more work done between recharges. In addition to providing longer run times, NuPower batteries are also built to last longer so they can deliver more use cycles before a replacement is needed. NewerTech NuPower high capacity replacement batteries are available for every iBook and PowerBook model produced from 1998 to 2006 including G3 PowerBooks with up to 62% more capacity, G4 PowerBooks with up to 48% more capacity, and iBooks with up to 64.5% more capacity. A One Year NewerTech Warranty is included with all NuPower replacement batteries. "We're very pleased to begin offering NuPower high capacity replacement batteries to MacBook and MacBook Pro owners," says Grant Dahlke, Brand Manager, NewerTech. "Whether needing to replace an older battery with diminished capacity or wanting a convenient spare for power backup, NuPower is a Plug and Play upgrade than can make a MacBook or MacBook Pro better than new." The entire NewerTech NuPower line of replacement batteries for Mac notebooks is available immediately from NewerTech's exclusive distributor, Other World Computing (OWC), as well as through the retail channel. QuickerTek now upgrades the wireless networking for all MacBooks and MacBook Pros, including the latest crop of Apple unibody MacBooks and MacBook Pro laptops. The MacBook/MacBook Pro Antenna Upgrade wireless upgrade provides a performance improvement that cannot be found in other antenna products in the $49.95 price range. This antenna upgrade attaches to the internal Apple AirPort networking card, moving the antenna up and out of the MacBook case. Alone this simple change makes a world of difference in wireless performance. However, QuickerTek also adds a more powerful 5dBi antenna, which again, boosts the wireless range and speed. There are no changes or additional software to use, so your MacBook works the same before and after the upgrade is installed. The removable antenna clips to the screen of the MacBook. The antenna cable attaches to the internal Apple AirPort card, passing through either the security slot or the ExpressCard slot - depending on the MacBook/MacBook Pro. A detailed installation manual and all the tools required are included with the product. The MacBook/MacBook Pro Antenna Upgrade is designed for the unibody MacBook 13-inch, 15-inch and 17-inch models including the 1st, 2nd and 3rd generation laptops. That's all MacBooks and MacBook Pro models. It also works with all Apple AirPort Base Stations, all 802.11 a/b/g/n wireless access points from Belkin, Cisco, dLink and most others as well. Compatibility includes wireless devices in the 2.4 GHz and 5.8 GHz ranges - which covers most any wireless network users are likely to encounter when going mobile. Like most QuickerTek products, the MacBook/MacBook Pro Antenna Upgrade is backed with a one-year warranty on parts and labor. QuickerTek has been a recognized leading innovator of power products, antennas and RF products for Apple Power Macintosh, Mac Pro, iMac PPC and Intel, PowerBook, MacBook and MacBook Pro computers. QuickerTek products can be purchased online at quickertek.com and from authorized dealers. PR: Florida-based Skydda Design introduces the BambooBook, their new premium quality case for 13" MacBook Pro computers. A unique combination of beauty and function, the BambooBook is manufactured of exotic bamboo and lined with plush, padded suede fabric. Its brushed metal hardware and contoured shape perfectly complement the fine aesthetics of the MacBook Pro. Finally, a case to transport and protect every MacBook that is it's equal in elegance and design. Like the MacBook Pro, the BambooBook is a marvel of fine craftsmanship and innovative engineering. Measuring just 1-5/8" x 14-3/8" x 11", this streamlined case is not much larger than most of today's laptops. As Apple sets itself apart as the most progressive manufacturer of computers in the world, the MacBook Pro has become the laptop of choice for discerning computer users. The BambooBook aims to be its perfect match. Thanks to the BambooBook's innovative design, users will have full operation of their MacBook Pro without having to remove it from the case. Just set it down anywhere, open the lid and it's ready to go. Plug in the computer's AC adaptor and even access the USB port while working within the case. 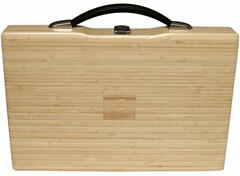 To protect the BambooBook's polished hardwood finish, the case ships with a stylish, formfitting vinyl cover. The cover zips around each side of the case up to the handle for easy access, and even has a pocket to conveniently store the AC adaptor, iPhone and other accessories. 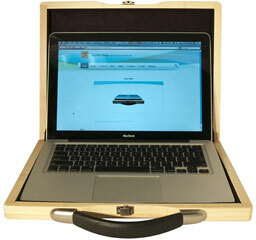 Custom made to fit and aesthetically match the MacBook Pro 13"
"High-tech electronics and quality hardwoods have been combined in luxury automobiles for years. We thought Apple Computer's sleek, new MacBook Pro deserved the same treatment," said Charles Hodgson, cofounder of Florida based Skydda Design. "And for those who take the word "laptop" literally, you'll just love how cool and comfortably the BambooBook sits on your lap. Imagine the convenience of working on your computer right inside its case. Whether you're waiting to board a flight or sipping a cup of coffee at your local Starbucks, just open the BambooBook, lift the lid of your MacBook Pro, and voilà! Your computer is ready to use. This unique feature sets the BambooBook apart from every other computer case on the market." 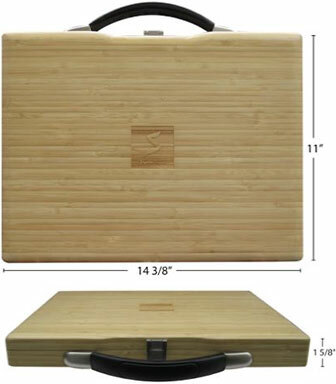 The BambooBook's hardwood exterior and padded interior provide maximum protection. Drop tests from a height of five feet onto a stone floor resulted in minor bruises to the BambooBook, whereas the MacBook Pro was free from any damage. It's the best insurance for the protection of every MacBook Pro owner. Extensive testing revealed that the MacBook Pro does not run hot, even after continuous use in the BambooBook, so users don't have to worry about their computer overheating. And, no more sweaty thighs. The BambooBook feels cool, comfortable and secure on the lap. Unlike other hardwoods that take several decades to reach maturity, bamboo matures in three years, regenerates without need for replanting and requires minimal fertilization or pesticides. What's more, bamboo has a warm, attractive grain that is harder than maple yet 30% lighter. Protect the environment and do it in style - Go green with a BambooBook from Skydda Design. The BambooBook is currently offered at the introductory price of only $149. To celebrate the launch of the BambooBook, Skydda Design is also offering an additional $20 off for a limited time. Please enter coupon code: "skydda20" when purchasing. This offer is valid until 12/31/09. 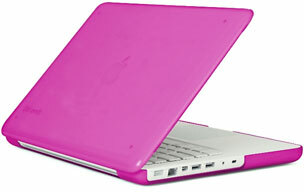 PR: Add a splash of color to your MacBook (new white unibody polycarbonate model) with Speck's SeeThru hard shell cases. Available in clear and pink and red, our road-tested, translucent cases stand out vibrantly in the sea of sameness. Device-specific engineering makes for a custom fit and highlights the look of your new MacBook. This hard shell will fit like a glove on your MacBook 13" (new unibody, white polycarbonate model.) It will not fit on older white MacBooks or any MacBook Pro. New Unibody MacBooks ventilate through the keyboard. SeeThru cases cause no change in temperature. Made of a special blend of hard polycarbonate plastic provides sturdy protection for your notebook and a shiny, colorful look. Design lets you open and close your notebook all the way and access all keys, sensors, ports, plugs and buttons through specifically-engineered cutouts. Weight: 1 lb. 3.0 oz. PR: Silky-soft to the touch with the same protection as Speck's trusted SeeThru line; check out SeeThru Satin. 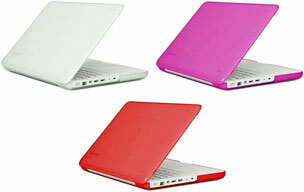 Give your MacBook (new, unibody white polycarbonate model) a smooth, semi-translucent, frosted finish with a grippy edge. Available in purple, red and black, our road-tested cases stand out vibrantly in the sea of sameness. Allows you access to all your important plugs and drives while highlighting the look of your new MacBook. This hard shell will fit like a glove on a MacBook (new, white polycarbonate unibody model only!) It will not fit on older white MacBooks or on any MacBook Pro. SeeThru Satin is made of our special hard polycarbonate plastic with an added soft-touch rubberized exterior coating to give it it's silky and grippy feel. The design lets you open and close your notebook all the way and access all keys, sensors, ports, plugs and buttons through specifically-engineered cutouts. Installing the SeeThru Satin case on your MacBook is simple and easy. First, gently dust off your MacBook before putting on your new SeeThru Satin. Close your MacBook and place the bottom shell on a table or hard surface. Press your notebook gently down into the shell until it snaps into the small tabs. Next, take the top shell and press it evenly down onto the top of your MacBook, applying pressure to the corners until it snaps snugly into place. To remove, pull the small tabs away from your notebook. If you are experiencing any difficulty, simply slip a credit card in the slot between your case and MacBook and pop off the tabs. Speck recommends removing the case periodically to dust or clean your MacBook.